Zlatan Ibrahimovic has yet again enticed a great deal of attention of the supporters by fancying an acrobatic shot right after his return from the horrible injury which kept him out for seven months. 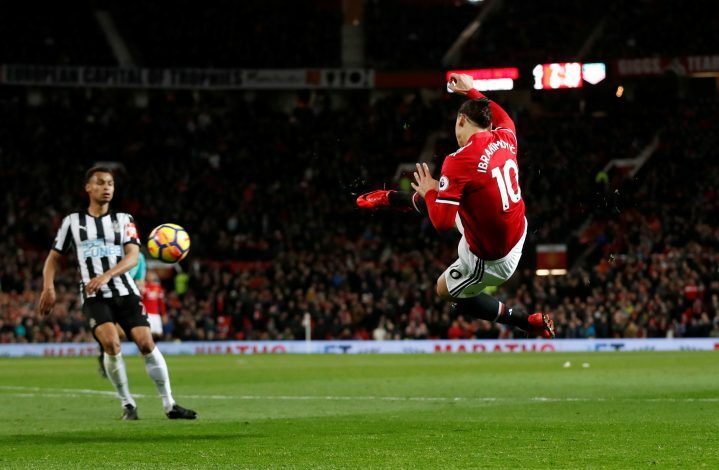 The baffling shot materialised yesterday, as United squared off against Newcastle United at Old Trafford, in which the home team secured a win with the scoreline of 4-1. The Red Devils seized the three points of the significant fixture, despite looking clumsy and disorganised in the first half of what happened to be an intriguing game. Nonetheless, one of the remarkable aspects of the match was the endeavour of late substitute Zlatan, as he almost made it five for the Old Trafford outfit with a bizarre athletic scissor kick, which Rob Elliot tipped wide. The robust striker, being sidelined for long, was feared to be out of touch by many supporters. However, he dramatically thwarted away the scepticism encompassing his form by the performance he showcased on Saturday night. The 36-year-old’s every touch was celebrated by the crowd with much enthusiasm. The Swede was introduced only in the 77th minute of the substantial fixture, owing to the fear of aggravating the dreadful injury, as he was deemed fit way earlier than the previously expected date. However, the decorated striker has returned safely, and is evidently back in action, with the supporters and club yearning for more of the drug the former PSG man provides when he’s on fire. The United fans will now hope to be driven to the edge of their seats more frequently during the months left in the versatile player’s contract.